Kitty Hawk Corporation co-founder and Stanford University adjunct professor in artificial intelligence, Sebastian Thrun, says that flying cars are not fantasy – and says they could someday make transportation safer. Walter Isaacson, author of biographies on Albert Einstein, Steve Jobs, and Leonardo DaVinci talks about where innovation comes from and, how resilience is the ‘secret’ for successful geniuses and innovators. Chef Dan Barber, the chef and co-owner of Blue Hill restaurants, discusses how he is applying his philosophies about food waste and conservation, to ideas that can be used to curb famine and improve nutrition, flavor, and inventive eating. Automation has already made some jobs obsolete, and AI experts Andrew McAfee and Erik Brynjolfsson, co-authors of the book, Machine, Platform, Crowd: Harnessing our digital future (2017), say that machines are able to be programmed to perform functions that may radically change even high-skilled jobs in the financial management and legal sectors. The pair are the co-directors of the MIT Initiative on the Digital Economy and have ideas for managing the impact of the next machine age on American workers at all levels. Neuroscientist Lisa Genova, the author of Still Alice (2014) and other books, speaks to Zakaria about the newest thinking in Alzheimer’s disease prevention. 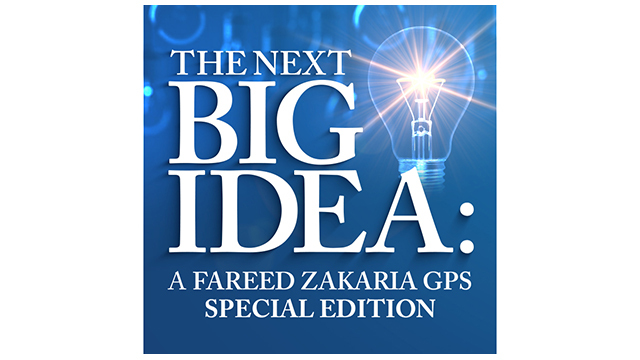 The Next Big Idea airs Sunday, Sept. 3 at 10:00a.m. on CNN/U.S. and CNN International. It will encore at 1:00p.m. on CNN/U.S. and 3:00pm on CNN International. All times Eastern.